I’ve talked about my plans for patient experience data in quite a few different forums recently, but it just occurred to me that it isn’t written down anywhere. Anyone who’s spent any time with me in meetings will know I’m a stickler for writing things down, so here it is. Anyway, I’ve now launched a new version built with shinydashboard which can be found here http://suce.co.uk:8080/apps/SUCE/. It launched a bit early at an event, so excuse any rough edges or bugs. So what’s the big idea, then? Well, it’s twofold. Firstly, I would like to integrate the staff experience data. My Trust has recently started staff about the experience they have working at the Trust and I have made sure that these datasets are tightly integrated. Ultimately I would like to build a dashboard that shows how staff and patients are on the same application. This will be of interest, e.g. to ward managers, who want to know how their staff and patients are. Further, it will facilitate analysis of the connection between staff and patient experience. The key design feature is summarising the data and allowing rapid drill down. So a service manager would start on a page with staff and patient experience data, but would notice something interesting, click it, and then be presented with more detail about that thing. Further clicks would lead to further drill down. So far, so ordinary. This is what all those private sector dashboard salespeople with the expensive watches they bought with taxpayers’ money all say. What I want to add as secret sauce (which will of course be open source, haha) is what I’ve taken to calling a recommendation engine for patient feedback. So when you buy something on Amazon it will say “people who bought that bought this, too.” And then you buy it and love it (I’ve bought loads of stuff using the Amazon recommendation engine. And listened to great music using Spotify’s). The big problem we have with experience data is discoverability. We have maybe 200,000 comments. How do you find the one you want? I’m trying to use machine learning to have the computer find other things you might be interested in. Reading some feedback about waiting lists? Here’s some more. Reading angry feedback? Here’s some more angry feedback. And feeding this engine staff and patient feedback data could make for a very powerful system. Lots of people are angry at their doctor? Well, look, all the doctors are fed up to. Join it with other systems. Food’s terrible? Well, look, 10% of the estates staff are off sick at the moment. 10% of the estates staff are off sick? Well, look, three months ago they were all miserable. And so on. It’s a very ambitious dream, but that’s my vision, and I’ll try as far as possible to build technologies that other Trusts can use. That is in itself quite tricky, so progress with that one in particular might be slow, but I’m trying to get more people on board. See how it goes. Another one that’s for me when I forget. The internet seems strangely reluctant to tell me how to do this, yet here it is buried in the answer to something else. Sometimes you are writing an RMarkdown document and wish to produce text with line returns between each piece. I can never work out how to do it. It’s very simple. Just two spaces and then \n. Like this ” \n”. Here’s some real code with it in. Reproduced above is a recent exchange on Twitter. I’d better open by saying this blog post is not impugning the work of Samantha Riley or any other plot the dots people. 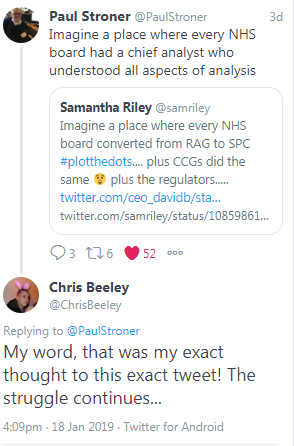 On the contrary, the whole #plotthedots movement is an important part of a cultural change that is happening within the NHS at the moment. But I would like to take up the rhetorical device Samantha uses, to explore the issues that we have understanding data in the NHS. Let’s take the tweet at face value. A world where every NHS board converted from RAG to SPC, along with CCGs and regulators. It’s worth noting that this would, in fact, be a substantial improvement on current practice. RAG rating presumably has its place as a management tool but as a data analytic instrument it is very lacking. RAG ratings treat 30 week waiting lists the same as 18 month ones- 16 hour waits in A and E the same as 6 hour waits. They give no help with interpretation in regard of trend or variance. In this new world boards will be able to distinguish chance variation from real changes. They will have due regard for both the trend and natural variation in a variable, and be able to adjust their certainty accordingly. This is all to the good. But let’s think about all the things that we’ve left out here (I don’t doubt the #plotthedots people are quite aware of this, I’m just using the tweet as a jumping off point). We’ve left out psychometrics. Are the measures reliable and valid? We don’t know. We’ve left out regression. How much variance does one indicator predict in another? We don’t know. We’ve left out multiple comparison. We reviewed 15 indicators. One shows a significant change. What is the probability that this is due to chance variation? We don’t know. We’ve left out experimental design. We’ve reviewed changes in measures collected on four different wards- two of which have implemented a new policy, and two of which have not. Is the experiment well controlled? Are difference due to the intervention? We don’t know. We’re interested in producing graphics to help managers understand patient flow throughout our organisation. Excel can’t do it. What can we do? Nothing! In the bin! I’m obviously exaggerating a little here, for effect, but the sad fact is that the NHS is in a very sorry state as far as its capacity for analytics goes. Many individuals who have the job title “analyst” in fact would more properly be called “data engineers”, in the sense that they can tell you very exactly what happened but don’t have a clue why. There’s nothing wrong with that, data engineering is a highly valuable and difficult skill, but it’s not analysis, and in fact career structure and professional recognition for true “analysts” (or, let’s dream really big here, “data scientists”) is sorely lacking everywhere. I passionately want proper understanding of and engagement with data and statistical concepts right from board all the way across the organisation, and in fact I am busy at the moment in my own Trust offering in depth tutorials and one off lectures on concepts in data and statistics. I strongly support APHA’s aim to introduce rigorous professional accreditation of analysts. You cite this in your RMarkdown using whatever identifier is on the top line, in this case I put the Butler2005 there, and in the RMarkdown you just write @Butler2005. You can cite R by just typing citation() into the console and copying the .bib into your .bib file, and you can cite, say, the psych package by typing citation(“psych”). with assistance from the psych [-@psych2018] package. The minus excludes it from the actual text while still including it in the references at the end. above the end line or something like that. That’s it! I just learned it from scratch, did it, and wrote this blog post in 10 minutes so you really have no excuse now, do you 😉 ? Data science accelerator lesson one- build a pipeline and ship the code! I’m not really sure if I’m going to get through all of it but I’ve made a decent start. I’ve made a Trello board and there’s a GitHub too. One of the things about the project I haven’t mentioned above is that I want to make something that can easily be picked up and used by other Trusts. There are loads of companies who want to charge money for NHS Trusts to use their black box but I’m trying to make something others can use and build on. So a lot of the work at the end will be on that. Anyway, I’ll share the work at the end but I’ve learned loads already so I thought I’d talk about that. It’s the best thing I’ve done since my PhD in terms of learning (so I recommend your doing it!) so there are lots of things I want to talk about. The first one isn’t super complicated or a revelation to anyone but it’s affected the way I work already. It’s this. Ship code! Ship it! Get it out the door! Up to now to be honest my agile working has pretty much been that I spend six months on something, I release it, it’s terrible, and then I make improvements. One of the product managers at GDS told me that they ship code every week. Every week! I couldn’t believe it. So I’m trying to work like that. Doesn’t matter if it isn’t perfect, doesn’t matter if some of the functionality is reduced, just get something in the hands of your users. Then if they hate it you can avoid spending a month building something they hate. And, something related to that, start with a pipeline. Right at the start of an analysis, start building the outputs. This helps you to know what all this analysis is actually going to do. It helps you to make the analysis better. And it gives you code that you can ship. Build something that works and does something and give it to your users. They will start giving you feedback before you’ve even finished the analysis. Too often we start with the analysis and only think about the endpoint when we’ve finished. Maybe it’s the wrong analysis. Maybe what you’re doing is clever but no-one cares. Build a pipeline and get it out the door. Let your users tell you what they want. So this is my annual New Year’s post, it’s an idea from David Allen that I’ve done before. 2018 was the year that I was finally (pretty much) better. I had my bowel and spleen removed in August 2017 and bled in quite a scary way, but by the time 2018 rolled around I was running 9 miles, building mileage ready for a marathon in May. It’s been a great year. I did have some pretty scary health problems (that I won’t go into) but it all worked out in the finish and I’m pretty much back to working and being happy with my family just as I was all the way back in 2014 before everything started to go wrong. So the first big news of 2018 was I got a new job (March). I’m now half time in my old job, and half time in the new one. They both link together, in that I do Shiny code and server admin to facilitate several dashboards that we use for staff and patient experience and some clinical stuff too. I’m absolutely loving both jobs. We’re doing a lot of stuff that is pretty new in the NHS, we’re the first Trust that I’m aware of with a Shiny Pro licence, and I’ve talked to people all over the country about what we’re doing. My Trust is very supportive and it’s all going really well. I suppose my next big thing was running a marathon in May. It wasn’t as fast as I would have liked (four hours and thirty three minutes), but I did have quite a few pretty serious problems with being ill so I did pretty well considering. I’ve got another one in 2019, more on which later. Next up was the British Transplant Games (July). It was my first time competing and I won bronze at 5K and 1500m, which was very nice. My big goal now is to qualify for the world games, I’m guessing silver would be enough to do that, partly depends on the time I guess, too. For the first time in my life I have a savings account, which is absolutely great, and I’m trying (and failing) to save three times my salary by February 2019. My wife and kids are a lot happier now I’m better, we all really went through hell so it’s been a great year just doing normal stuff you can’t do when you’re ill, like go abroad. And the most recent thing that’s exciting is starting the data science accelerator. I keep meaning to blog more about it, I’m overbusy just doing it, but there’s a GitHub with some of the first steps on here. Text analysis is really easy to do, and really hard to do well, so I’m really glad that I’ve got a mentor to guide me through it. I’m working really hard trying to build some robust analysis and hopefully deploy some sort of reusable pipeline that other NHS Trusts can use. I’ve been dabbling in Python, too, which I really want to do more of. I feel like having other languages could help me build more and better stuff more easily. I’ve really bought into the whole agile development thing, as well, that’s a part of the accelerator, and one of the talks by a product manager was fascinating. So that’s it for 2018. I’m starting 2019 strong. Very strong. My health was a teensy bit wobbly this time last year but I’m as strong as an ox at the moment. It really feels good after being frightened and weak for such a long time. At work I want to tie up all the threads and be a part of an agile data science team, producing robust statistical analyses using interactive web based technologies (like Shiny!). Oh yes! That reminds me. Of course last year I also wrote a book and I started teaching statistics to Trust staff- advanced stuff in 12 one hour tutorials and a quick review in a 2 and a half hour lecture. The teaching has been going really well, I’ve been getting a lot of good feedback and I’m really hoping it helps my Trust do better with the data it collects. I live a blessed life. All I want to do in 2019 is keep doing the same stuff I already do and love. Run a faster marathon (sub 4 hour). Get a silver medal. Be part of a bigger, better data science team. Keep doing all the stuff we’re doing with Shiny and text analysis and help other Trusts to do it, too. And more than anything else I want my family to just live a normal life and forget about all that stuff between 2015-2017. Oh yeah. And I want to solve the Rubik’s cube, too. My eldest got one for Christmas and it’s got me hooked. This is just a quick post to show some of the stuff that I’ve published/ presented/ put on GitHub recently. So my Shiny book, Web Application Development with R using Shiny, 3rd edition, is out, and I’ve forked the code from the publisher’s repository onto my own GitHub to make it easier to find. I’ve also put the talk I did about text processing at the Nottingham useR onto my GitHub as well. Find the Shiny book code here. The UI development book is here. And the tidy text talk here.